24 Hours Blogging!..... : Rahman to make Broadway-style musical in india! 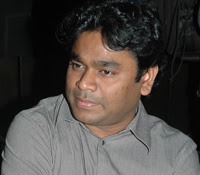 A.R.Rahman is considered to be one of the stylish music Director. And the man who redefined music in Indian films is now set to redefine it again. But this time, it will now be in films, but in theatre. Yes. After scoring successive hits with his Bombay Dreams and Lord of the Rings Musical abroad, India’s best-known composer is now in the initial stages of making a Broadway-style musical in India. Rahman, who always yearns to be different, wants to give Indian audiences a musical treat that will enable them to experience the joy and thrill of watching a Broadway musical in India. Rahman is right now working on a proper script for the musical and intends to showcase his grand musical production in India before taking it around the world. The cast and crew will be predominantly Indian, though Rahman hopes to bring in some big names from the West too for his Indian musical. The ‘Isai Puyal’ assures that the show will be up to international standards. However, he says he cannot talk about the budget right now, as the venture is still in its infancy. Rahman’s Bombay Dreams cost 4.5 million pounds while The Lord of the Rings Musical cost a whopping Rs. 950 million. Time and again, Rahman has been exploring new avenues in music, setting a path for others to follow. He infused a breath of fresh air into the Indian album scene with his 'Vande Mataram'. His Bombay Dreams took popular Indian music to the West and had foreigners lapping it up. He had also the composed hit singles, ‘Pray For Me, Brother’ for the UN and ‘One Love’, a tribute to the Taj Mahal. Recently, on January 6, Rahman had announced his plans of setting up a music school in Chennai, thus coming out with country’s own orchestra.